This was told to me by a disgruntled fellow player as we were making our way to our tee time at a PDGA event. He went on to express the sadness and disappointment he felt when he found out many of the local disc golfers that his son looked up to regularly smoked marijuana illegally during their rounds at the local course. This was not my first and it definitely has not been my last conversation like this. It seems that the use of drugs and other substances are intertwined with disc golf. We found this data very interesting, and we would like to spread this topic across several articles to give each aspect of it the attention it deserves. This article will focus strictly on the use of Marijuana while playing disc golf. Well, Isn’t it Pretty Much Legal? So is it safe to assume that 92.7% of the disc golfers who took our survey chose to smoke marijuana illegally? Not necessarily. A handful of states have legalized marijuana for medical purposes, and our survey did not not ask where the pot smoking took place. 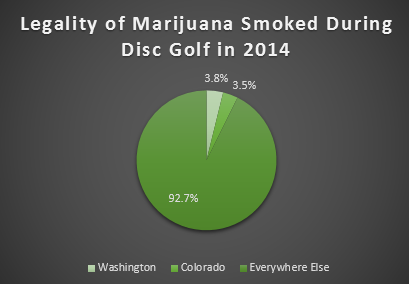 (Maybe all 92.7% went to Washington or Colorado whenever they smoked marijuana on the course?) Even with the benefit of the doubt, it is safe to assume that a good portion of the marijuana smoking that occurred on the disc golf course during 2014 was smoked illegally. Marijuana and Disc Golf: Best Friends or Worst Enemies? Now to the debate that rages like wildfire in the disc golf world: Does marijuana on the course harm the sport, and therefore need to be burned elsewhere so that disc golf can thrive? Or should we all just learn to get along and embrace the “counter-culture” as an inseparable part of disc golf forever? Of course, to give these questions the proper attention, we need to answer another question. Where do we want to see our beloved disc golf in the future? Do we want to see Paul McBeth and Ricky Wysocki battle in a play-off for the World Championships on ESPN? Or do we want to keep disc golf to ourselves–free to play and low key? We’ll let everyone draw their own conclusions from this data, but there were a few things that caught our eye. 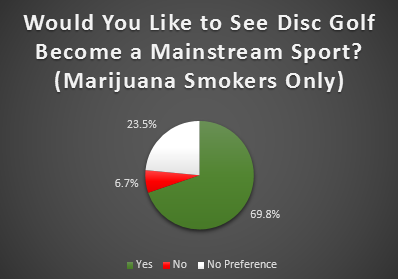 It would seem natural to assume that a greater majority of disc golfers who don’t smoke marijuana would want the sport to become mainstream, but this spread was only slight (a difference of only 7.9%). 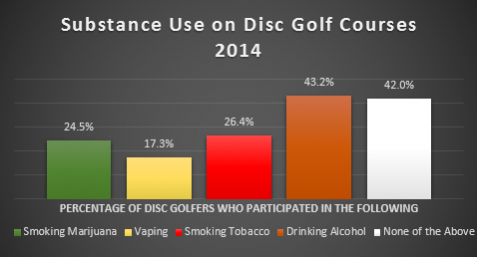 So, it seems safe to say, all disc golfers regardless of drug use, want to see the sport grow into the mainstream. This raises even more questions: Do we want to bring the pot with us? Should we? Can we wave the flag of “Grow the Sport” and keep our stash of weed in our back pockets? Some have fought to make this type of scenario a reality (we all remember the Vibram Four20 release from early 2014), and with at least two more states making marijuana legal in 2015 (Oregon and Alaska), the possibility of a mainstream society embracing disc golf and marijuana together is looking more and more plausible. Of course, this potential reality still faces a lot of friction (we all remember the Vibram Four20 discontinuation also from early 2014). There are many who have expressed a desire to keep disc golf drug free and “family friendly.” And the one huge barrier: Marijuana use is still illegal in most of the United States. This brings us back to my friend and I on our way to the tee. He not only was upset about his boy witnessing a drug deal while playing a sport they both loved. He also shared with me an experience he had when attending a city council meeting where he was lobbying for the installation of a new disc golf course on public land. He was all but completely shut down when the city council informed him of the alarming rates of drug related crimes reported in the area surrounding their existing disc golf course. Naturally, they were more than hesitant to approve another disc golf course. 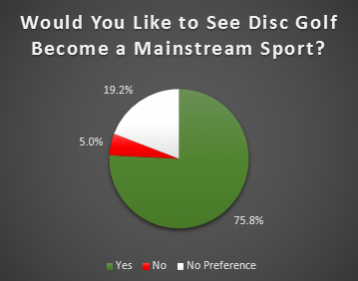 Will Disc Golf make it into the mainstream? We sure hope so (at least 75.8% of us). Will Mary Jane make it too? Well, at least some of us hope so (69.8% of 24.5% of us). Something that should be noted is that even though pot may be legal in some states, it’s generally still illegal to smoke outside the privacy of a home. Therefore, smoking on the disc golf course is still illegal. I personally think it smells nasty and I’m tired of the metaphorical blue haze hanging over the courses. Great article. I like lots of data since I’m fairly nerdy/geeky myself. I appreciate the distinctions between the various points of debate. However, this topic feeds directly into a bigger issue. Most public parks and common areas have banned or strictly prohibited all forms of smoking and often alcohol consumption as well. I can’t do anything about people’s decision to partake in these substances but I personally don’t agree that partaking of any of these substances are “family friendly”. It would be great if disc golfers and their friends and family that join them on the course could just leave their substances behind and just follow the rules of the courses and laws while they are there. Seems simple and fair enough to me. Hopefully others may agree. Although I believe a little discretion is necessary where children are concerned, I have no issues with people smoking pot or drinking on the course. For heavens sake-they drink and smoke tobacco products on a ball golf course, so what the hell? This article brings up a lot of good points, and it’s great to see the data speak for itself. Personally, I don’t care what people do in their own homes until it starts to affect others. But that’s the problem, isn’t it? It’s pretty safe to assume that the people who are lighting up on the course don’t smoke exclusively on the course. What that results in is a general stereotype that disc golfers are pot smokers. Discretion around children? Yes, but that isn’t limited to smoking marijuana; think foul language, unsportsmanlike play, etc. This extends beyond discretion. Bringing the disc golf community down by openly, or discreetly, participating in illegal substance use is irresponsible and hinders the efforts of those who love the sport and want to nurture it. Not saying their aren’t plenty of disc-golf-loving potheads. Their actions, though, reflect negatively on disc golf as a sport, and hurt the reputations of the people who don’t blaze it between tees. very nice article indeed. The only aspect you missed is that some things (typically non smokers) that pot smoking significantly improves your game, which is imo quite interesting topic as well. one technical note… according to one Vblog of Steve Dodge (too lazy to search for it, so you have to believe me or do it yourself – it was quite shortly after Four20 release), this was pretty much nothing but marketing with one significant “side quest” though – start the debate about pot smoking and disc golf, which worked quite well imho. + It was the number of the prototype disc (420) which was a chosen to go to production. + It was announced as limited edition only. For the sport to grow tp the level where the top players can make a living befitting the athletic talent they bring to the sport many things need to change loud unsportsmanlike conduct drug and alcohol use smoking cursing all have no place at pdga santioned events and shiuld be inforced to the highest degree…casual rounds on your local coarse is a little differant..I would hope that any desent adult player would keep there indescretions away from younger players. I am a retired corporate business executive, have played tennis and ball golf for decades . My son introduced me to disc golf about a year ago, and I immediately fell in love with them game. I don’t need to elaborate on the merits and benefits of this sport. It has been wonderful, and I have introduced some of my friends to it and they love it ,too. But, there is a perception about the game and those who play it. At my home course, smoking pot is not only typical but somewhat prevalent, even among the local disc golf club membership. Honestly I am not sure why and do not wish to get into a discussion regarding such. However, if game is be elevated to true mainstream status as a sport, something has to change. I will add that I go to many websites to look for discs,etc. and I see a lot of vulgarity , obscene pictures, etc. stamped / printed on discs for sale . Additionally, I read reviews of disc courses on familiar websites, and many are filled with foul language, etc. The gentleman who quoted Dylan is right, ” the times are a changing “, but some things should not , and this is especially true if the proponents of this game want it to grow into a major sport, and not be tagged as something else. Weed or no weed. If disc golf is gonna go mainsteam it’s just simply gonna go mainstream. Look at skateboarding and how it was bashed by parents and whoever else for the longest time. Not to mention had its own issues with weed and still does. But guess what Tony Hawk’s living room could fit the lot your house sits on in it. all sports and close all parks and there just one choice everything close down. why not teach at home. I am 72 years old have only played disc golf for 2 years. have met the most friendly and help full people played with anybody just for the fun of the game. One old man only had 1 Frisbee one young man was throwing one and jogging to it then teeing off for the next hole. Family playing together. It has to be one of the best Free Recreation and Friendly help full and more. I don’t see what the problem is. Some people mentioned basically trying to “class up the sport” to get on the level of paid pro’s and everything else in the name of “progress,” well look at regular golf! People get hammered, drinks are delivered to you on the course, people smoke cigars, cigarettes, and weed! What’s the difference? The progress of this sport has nothing to do with people drinking or smoking while they play. Just like any sport, most of us won’t go pro, we compete for fun or just play for fun, so who cares! And why are people concerned about marijuana smoke on the course but not tobacco? Are you still telling your kids tobacco is ok and alcohol is but marijuana isn’t?! Times are changing, marijuana is proven safer in every way possible. C) I don’t condone drinking on public courses either since that’s also illegal and many of the offenders leave their garbage lying around everywhere. A good rule of thumb in life is to mind your own business. So as long as there are no victims (smoking indoors, or in someone’s face), who cares? Adults should be able to determine for themselves what they do with their own bodies. As far at the future of the sport, I think it will get bigger because it is cheap (discs), fun (regardless of skill level), and free to play. I don’t think it will go mainstream because it’s not a very athletic sport. I think people like Ben Askren could help increase awareness and popularity for the sport. This debate is not going away any time soon. Disc golf will continue to grow, hopefully larger than all but the biggest dreamers can dream. Mary Jane will also continue to grow. The real question: Will disc golf EVER shake the stigma of a ‘pot smokin’ hippy’ throwing frisbees around the park and break into the mainstream media for good? ESPN has helped on the exposure front, but what is the next step? Websites like Infinite Discs, Heavy Disc, Rattling Chains and others are pioneering exposure to the masses through information dissemination. It is the personal responsibility of EACH AND EVERY ONE OF YOU reading this to grow the sport as you see fit – a very small portion according to the numbers above will fight to keep the game in the shadows. Keep recording aces and sending them to every news outlet you can find, send out press releases, give lessons for free, give away a disc or ten! I don’t smoke. I don’t care if people do. People should be discreet if they do. People who are saying they’re bothered by the smell are ridiculous people who shouldn’t be taken seriously. There are lots of smell on the disc golf course. Based on the harm done these people should be more concerned about dropping or skunks. I don’t think anyone is talking about banning those. Indiscrete drinks drinking legally are far more of a nuisance than people discretely smoking pot. 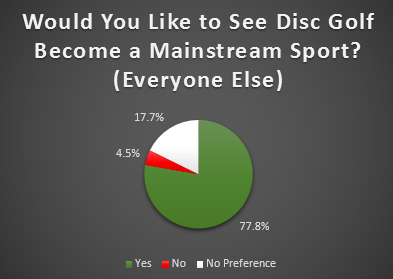 I don’t care if disc golf goes mainstream unless it means more leagues. If that’s what it means I’m against it. Who are you to judge what my sinuses find offensive? I find the smell of pot smoke to be just as offensive of a smell as a skunk and way worse than anything else I’ve ever smelled on a course. Cigarette smoke ranks a close second, but it’s legal (unless otherwise posted) so there’s nothing I can do about that except move on. I shouldn’t have to deal with my body being exposed to an illegal substance while playing disc golf on a public course. Disc golf is not golf…..it is merely jazzed up Frisbee. Change the name to what it REALLY is. Only small segment of population will ever consider this to be mainstream. Yeah right and u are gonna tell me skateboarding is mainstream. It is for only those who consider it to be mainstream in their eyes and that is a small number of the population. Played the game and would rather go shopping at walmart….wait I was playing with walmart shoppers ha.